• Categorized under Ideology | Difference Between Totalitarianism and Dictatorship. Although democracy is the most cherished and sought after form of governance in spite of some flaws attached to it, from the beginning of the idea of state, a number of other forms have been in existence. These are despotism, tyranny, totalitarianism, and dictatorship, and the central idea of these forms is to fiercely oppose democracy. Totalitarianism and dictatorship both have zero concern for fundamental rights of the citizens and both have certain commonalities as regards implementation of the will of the ruler. In spite of this, some fundamental differences exist between the two and this article attempts to highlight and explain some of those. 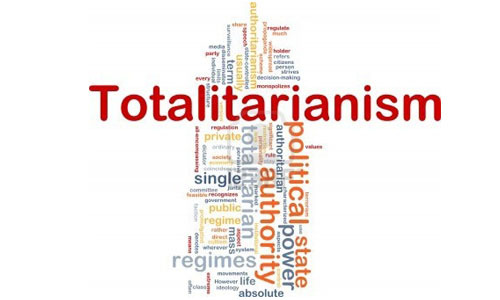 Totalitarianism is a political concept of governance of state, where private as well as public life of every member of the society is controlled and monitored by the political party in power. Every civil institution of the state is forced to follow agenda dictated by the party in governance. Under the system, unquestioned loyalty to the state is considered sacrosanct by the government, the ruling party, and the majority of the citizens as well. Political ideology of the ruling party & its’ supporters is viewed as synonymous to state ideology. Human value of a citizen is adjudicated in respect to her/his respect and loyalty to the state. Totalitarian regimes are aggressively nationalistic and implement law ruthlessly. They are comfortable in seclusion, as they are scared of infiltration of liberal thoughts. Nazi rule in Germany, Communist rule in Soviet unions, and Combodia are examples of yester-years’ totalitarianism regimes. In today’s world totalitarianism is seen to exist in North Korea, China, and Iran. Totalitarianism may give rise to racial hegemony as witnessed in Iraq under vehement nationalist Saddam Husain. There are some totalitarianism states like Pakistan and Saudi Arabia where religious beliefs and strictures are taken to form the core of state constitution. Dictatorship refers to an autocratic system of governance, where a single person rules with absolute control over the people, government, military, and judiciary. In dictatorship no rule of law exists and the whims of the dictator are considered as law to be obeyed by all and sundry. The dictator acquires power without consent of the people, and sticks to power by brutally suppressing any voice of dissent. Spirit of democracy in any form is highly apprehended by the dictator, and the administration continuously manhunts, scares, and even physically eliminates anybody who dares to disobey the dictator. The dictator is continuously under the fear of being toppled by powerful and ambitious opposition, and this makes him crueller and even barbaric. A dictator acquires power by a number of means, like hereditary, military coup, highly controversial constitutional means like emergency, and even through election in a fragmented democratic set-up. Many a time dictators are supported, funded, and protected by powerful business people, and manipulative foreign power. Apart from Germany under Hitler, Uganda under Idi Amin, Cuba under Fidel Castro, Libya under Muammar Gaddafi, and Zaire under Mobutu Sese Seko are some of the infamous dictatorships, the world has seen. Totalitarianism is generally based upon some hegemonic political ideology; whereas dictatorship may or may not base upon such ideology. In totalitarianism governance is reflection of the ruling party’s will; whereas in dictatorship an individual’s will is reflected in governance. Totalitarianism is all about controlling everything by party in the disguise of state. Dictatorship is all about acquiring power without the consent of people, and stick to power by means fair or dark. In totalitarianism the ruling party is chosen by the people in the absence of any alternative political party, which they think is better than multi-party system. In dictatorship the dictator is not chosen but is self appointed, or the people are forced to choose. Totalitarianism is scope-of-the-government centric, and dictatorship is source-of-the-power centric. In totalitarianism absolute power remains with the highest decision making body of the party. In dictatorship, absolute power remains with the individual dictator with sub-ordinate power to the coterie. tapas. "Difference Between Totalitarianism and Dictatorship.." DifferenceBetween.net. February 17, 2015 < http://www.differencebetween.net/miscellaneous/politics/ideology-politics/difference-between-totalitarianism-and-dictatorship/ >. A dictatorship is when ( ONE ) person is in charge or the kingdom, city,or town. A tatalitarian is when the people are ( WATCHED) over a group of high power people. Totalitarianism is the concept of being ruled by a chosen political party. A dictatorship is when a single person has absolute power over a nation.